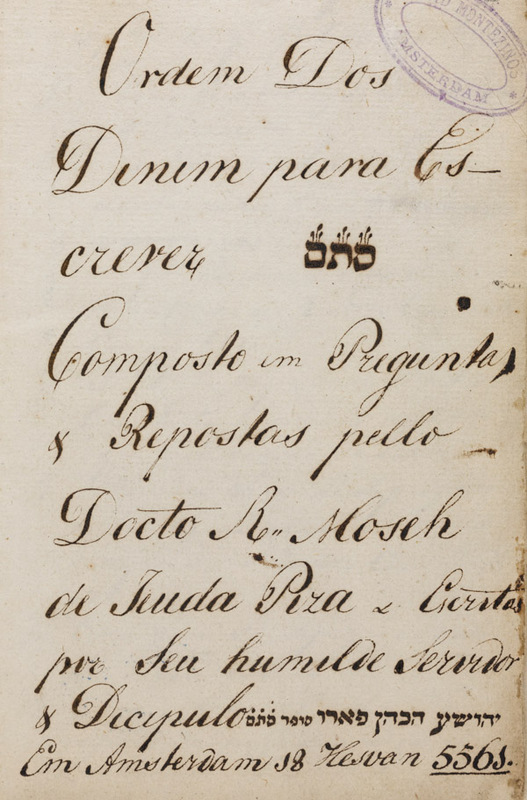 Collection of halakhic precepts for the writing of liturgical texts collected by Moses de Judah Piza, written by the scribe Josuah Cohen Faro. Ordem / dos / dinim para es-/ crever סתם / composta em preguntas / e repostas pello / docto R. Moseh / de Jeuda Piza e escritas / por seu humilde servidor / e discipulo סופר סתם יהושע הכהן פארו (Jeozuah Cohen Faro) / em Amsterdam 18 Hesvan 5561. Collection of halakhic precepts for the writing of liturgical texts collected by Moses de Judah Piza, written by the scribe Josuah Cohen Faro. Amsterdam, 1801. Text in Portuguese with Hebrew annotations / Paper / 17,1 x 9,9 cm. / 12 ff. (last 4 ll. blank) / Current Dutch writing with some square Hebrew characters. Fuks 75. Fundação Calouste Gulbenkian.